courtney the mom 1 Comment on how to get kids to do chores, militant single mom style…. 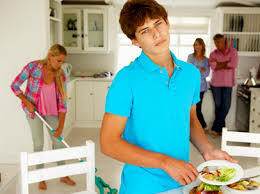 Trying to get kids to get their chores done can be very frustrating. 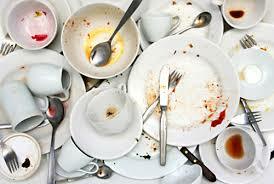 One day while I am working around their not-done chores – like every dish in the house is dirty, like the image below! I realize I need to get a few groceries, when an epiphany occurs! I decide that I am not buying more groceries till the chores are done! I tell my sons of my awesome plan (my daughter is at University). Of course there is the initial disbelief that this will not really occur, but I talk about the food supplies, that I could eat for weeks with what’s here, but the items that they really like, will not be replaced. They attempt to cover with comments about needing to lose a little weight anyways. Oh, really? I feel that this is one of those defining moments. Where it is parent against child, in a passive yet determined struggle within the balance of powers in the home. What they don’t know, is that I am not going to budge, there is food around here, including a 8 lb bag of rice. Besides, its not me that is not doing my chores, is it? I tell them that I will simply eat other food while they are at school, and have rice and lentils for dinner. After all, I like rice and lentils. I start posting the daily report to my Facebook friends, and support is coming from every mom on there. If I had had any doubts about this parenting technique, I know now that I AM RIGHT! On day 4, I came home with an Ice Cap. I love those things, more than food. The boys look at me and this perfect drink and start to complain. I explain that I realized that I was doing my chores, therefore I get new food. They were old enough to see the indisputable logic in this. The chores were actually done, and properly too! There was no yelling, no tears, no bargaining. The balance of power is now restored. There is peace in the valley. This following post is similar in that a choice of spending occurred, new Xbox game vs. new groceries – Xbox game won out! Here’s an awesome site, showing the pro’s and con’s of any choice or debate.